Braces work by slowly moving your teeth over a period of time. The brackets and wires put pressure on your teeth to move them into the correct placement. Your orthodontist will adjust the braces periodically in order to keep moving the teeth into the desired position. Dr. Edgren in Greeley does everything possible to make sure patients are comfortable both during and after the adjustment. However, you might find that you experience a little bit of discomfort after your adjustment, as the pressure applied starts to move your teeth again. If you are experiencing some pain, here are some tips that can help make you feel better! Take an over-the-counter pain medication. Your dentist might have a recommendation or use a brand that you’ve had success with in the past. An anti-inflammatory pain medication is a good choice, too, since some of the pain you are experiencing is likely from inflamed gums. Apply a topical anesthetic. There are anesthetics that are made specifically for the mouth. Ask your dentist or pharmacist for a recommendation. You can apply them to the areas where you are experiencing the most pain with your finger. Ask your orthodontist for dental wax. Dental wax is a lot like what it sounds like! It’s a wax material that’s made to go in the mouth. You can use it to cover up the areas of your braces that are irritating the lining of your mouth. You might find this especially useful at bedtime! Eat and drink cold foods. Think of this as the perfect excuse to eat ice cream! Cold drinks and foods are ideal when your teeth hurt. That’s because the coldness will act as a numbing agent and it will help reduce the inflammation in your mouth as well. Stick to soft foods. This is one of the best tips to help prevent your mouth pain from becoming worse, too. Stick to a diet of soft foods for a couple of days after your adjustment. Ice cream (hooray! ), soups, and smoothies are all good options. Use an ice pack. Placing an ice pack on your jaw can help numb the pain. You can also consider gently sucking on an ice cube, but make sure that you don’t bite down on the ice or it could make your pain worse. The important thing to remember with your braces is that the pain is temporary. After a couple days, the pain should be barely noticeable. Many patients find they can manage the pain a lot better when they are distracted from it. You might want to consider scheduling a fun activity with family or friends during the first couple days after an adjustment to your braces. And ultimately, remember that this pain will be worth it when you have a gorgeous, straight, and healthy-looking smile! 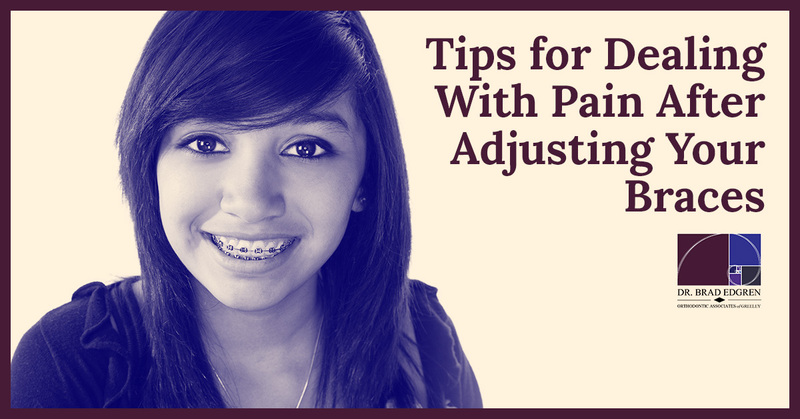 Need More Tips to Make Wearing Your Braces Easier? Our braces team here in Greeley is always here to help you. If you are having issues with your braces, are concerned about the pain, or just have a question, we’re always happy to help. Get in touch with us by giving us a call or contacting us through our website today.